It was part of his "re-education." You see, Xi's father was a founding member of the Communist Party of China. But this hurt, rather than helped, Xi when his father fell from power. He was seen as a privileged "princeling." And the Communist Party didn't want him. Xi underwent years of hard labor in the fields of Liangjiahe to "cleanse" him of his affluent upbringing. The party rejected him 10 times. But it finally accepted him in 1974. China recently enshrined his thoughts, ideology, and even his name in its constitution. It's a symbolic gesture that elevates Xi to the same status as famed Chairman Mao Zedong. Based on this, his influence in China will extend for potentially decades to come. This event only happens once every five years. Thousands of party officials and nine research committees attend. Twenty-five think tanks submit reports. It's big. During President Xi's three-and-a-half-hour opening speech, one sentence stood out: "Houses are built to be inhabited, not for speculation." It's time for Chinese investors to move on from the property market and into the stock market. We won't officially know until the middle of next month how China will implement regulations limiting speculation in property. That's when China will hold its Central Economic Work Conference. It could end speculation on housing prices in China as we know it. And it could usher in a new era of investing... one that will send another $1.7 trillion pouring into the Chinese stock market. Chinese equity holdings will swell by up to 11 trillion yuan ($1.7 trillion) in the two and a half years through end-2019 amid policies to clean up the financial system, Morgan Stanley predicts. Now, I know what you're thinking... "$1.7 trillion in Chinese stocks by 2019? What's going on here?" They save a lot of it. And they put the rest into property. The stock market is nearly irrelevant to most of them. 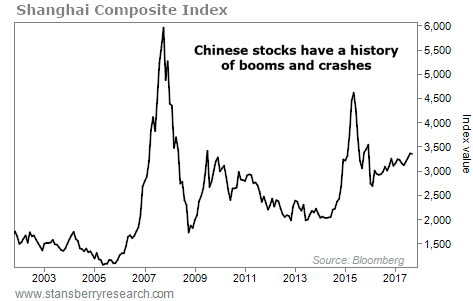 When the Chinese stock market first opened in the 1990s, it only offered trading in boring, state-owned companies and had limited reliable information for investors. In the last dozen years, the Shanghai Composite Index has risen more than 100% three separate times. Gamblers run it up like they're winning the lottery, and then it crashes back down. That sentence marks the end of Chinese gambling in the stock market – and the start of a new era for investors. "Real" investors in China have bought property – and that's about it. That has led to some serious imbalances in the property markets. A decent apartment in Beijing costs $1 million or more. Shanghai is even more expensive. Buying an apartment in China's largest cities is nearly impossible for the average person. Now, Xi and the Communist Party have announced their intentions to do something about it. The housing market will become less of an investment vehicle. The stock market will take its place. Morgan Stanley agrees – and says that $1.7 trillion will go into Chinese stocks by 2019. This is the beginning of the institutionalization of the Chinese stock market. This is the end of the gambler's market in China... and the start of the modernization of China's stock investors. My advice today is the same as it has been for years... Get your money there first. "It's time to take action," Steve says. Most investors still don't recognize the opportunity in China... But now is the perfect time to get on board. Read more here: Nobody's Throwing Rose Petals at My Feet. "In reality, China has already surpassed the U.S.," Justin Brill writes. 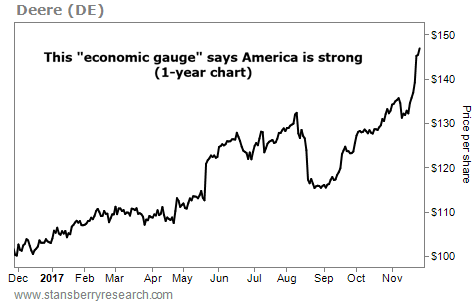 "We just don't know it yet..." Learn what to expect from this dominant economic power right here: Shocking Stat Shows China Has Overtaken the U.S.